You’re going to love your new eyewear! Ocean Eye is an optometry office and optical gallery founded in beautiful Summerville, South Carolina. We now have two more offices located in Trident and North Charleston, South Carolina. 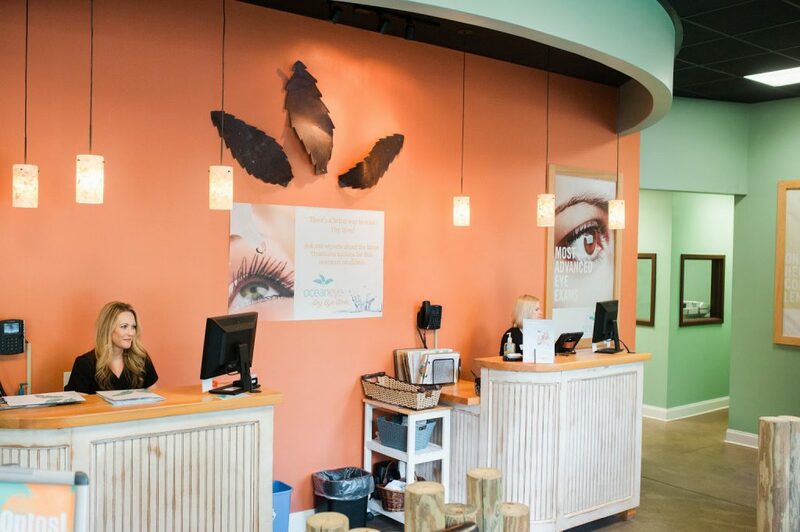 We provide eye care in a very unique and relaxing atmosphere! As you enter our office, you will be greeted by a friendly and knowledgeable staff member whose one and only focus will be to ensure you have the best experience possible. You will be offered a cool glass of lemonade and can enjoy it while listening to Hawaiian music in the background! We promise that your eye exam will be extremely thorough yet efficient, and our knowledgeable staff and eye doctors will be glad to answer all of your questions. If you should need vision correction in the form of glasses, contacts, or LASIK surgery we promise to present the most advanced options that will exceed your expectations. The most friendly staff and physicians! Love the relaxed atmosphere. Excellent customer service and clarified all questions I had. Won't be going anywhere other than Ocean Eye for my family's needs! I took my son here for his first eye checkup, and it was great. The office has a comforting atmosphere and the staff are very kind. My son needed reading glasses and it was no trouble getting him set up with the pair he liked best. Definitely will be going back regularly! Great service. Made me very comfortable.. thanks for the sweet tea and chocolate candy.. This will be my 3rd pair of glasses from the Trolley road and I LOVE THEM!! Great service. Been going for years and couldn't imagine going anywhere else. Great atmosphere with very helpful and friendly people. They helped me to decipher my insurance and keep the cost as low as possible. Thank you! The Doctors & staff are AWESOME!!! They are always pleasant & happy to see you when come. I've NEVER had a bad experience with them. Very friendly staff. Prompt service. Great Eyewear selection and the office has an incredible laid back atmosphere!!! Great place for your eye exam in North Charleston. They all were nice and very helpful during my visit. My buddy Kevin will hook you up to your satisfaction. I would definitely recommend my family and friends to give Ocean Eye a try. Keep up the good work guys. Had my first Eye exam at this location and would have to say it was a very pleasant experience. The staff was kind and curtious and listened to my needs. All in all I would recommend Ocean Eye to anyone needing this service. Walked out getting new prescription of normal glasses and sun glasses as well. So sit back, relax, and enjoy your very own Ocean Eye Experience!